"I try to preserve the wood's second life as a barrel, and its first life as a tree," says Whit McLeod, 48, who crafts furniture out of salvaged wine casks at his eponymous wood shop in Arcata, California. This one-time wildlife biologist for the U.S. Forest Service (and brother of Niebaum-Coppola's head winemaker) found his calling in 1991, when he spotted hundreds of abandoned redwood casks by the side of the road; he traced them to a winery that was about to ship off 36 white-oak casks for firewood. "I knew it was historical oak, so I had to make something worth keeping." 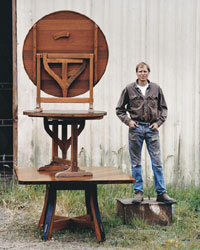 He now creates more than 30 models of tables and chairs inspired largely by the American Arts & Crafts movement; many show the iron marks of the cooper. He and his wife, Kristy, hand-sand and hand-finish each piece. How does he measure his success? "This year, we'll divert roughly 100 tons of wood from the landfills, most of it white oak" (from $1,320 for a table; 707-822-7307 or whitmcleod.com).